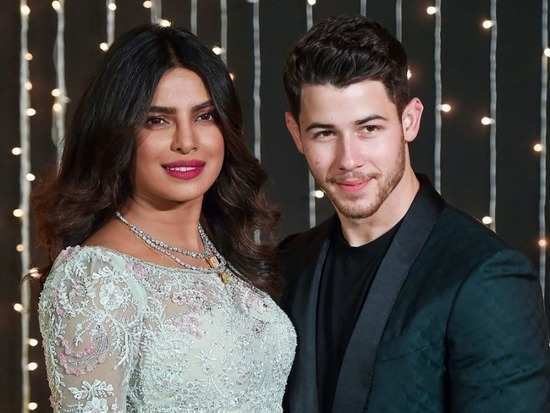 Priyanka Chopra and Nick Jonas have been setting couple goals for everyone ever since the two got hitched in December last year. The duo has been spotted together on various occasions and not once have they been able to take their eyes off each other. Priyanka who is currently busy promoting her upcoming film 'Isn’t It Romantic?' was recently spotted at a show where she was asked about taking her husband's last name post marriage. To this, the actress said, "I always wanted to add his name to mine because I feel, like, you know, we’re becoming a family and I’m a little traditional and old school like that. But it didn’t take away my identity. He gets added to who I am." Now, isn't that what marriage is all about? Priyanka and Nick were also recently spotted holidaying at the ski resort town of Mammoth Lakes, California. The couple along with a few other family members including the Jonas brothers, Sophie Turner and Priyanka's mom Madhu Chopra went there for a little vacation. Priyanka and Nick had both taken to their Instagram accounts to share videos and pictures of the families having fun together and boy does it look like they all had a blast. Well, we certainly wish joy and happiness for both the families. And we look forward to more pictures of the couple. Stay tuned for more updates. Did you know about any of these bizarre medical conditions? Priyanka Chopra and Nick Jonas' latest pictures will make you want to head for a vacation! Will Sonam Kapoor play the leading lady opposite Akshay Kumar in 'Sooryavanshi'? 5Priyanka Chopra and Nick Jonas' latest pictures will make you want to head for a vacation! 8Will Sonam Kapoor play the leading lady opposite Akshay Kumar in 'Sooryavanshi'?